As I mapped soils throughout eastern Iowa back in the early 70’s, it was interesting for me to put together a picture of what the original landscape looked like. In eastern Cedar County, I came upon some soils that did not fit the general description of prairie or savanna soils in that they were somewhere in between the two. I pondered this as I walked day after day over the land and began to see the picture in my mind. Savannas are transitions from prairie to a micro climate that favors some tree growth. There must be all grades of transition but what are they called? When does a prairie become a prairie as we walk westward out of the timber into the savanna into the “prairie”? When does a prairie become a savanna? What is your definition of a savanna? I don’t think there is a definition or name that can be placed on this “la la land of the past”. One way to look at these ecosystems is to imagine an interaction not individual influences, although they may be critical. If we back away in time and peer down from above, we can see a constant winning and waning of movement much like the tides that come and go. What footprint is left in the soil to give us clues to the past? Certainly visual imprints are evident even though the land is now covered with corn and beans. John Madson, who wrote Where the Sky Began, so beautifully described his vision of coming out of the timber and seeing, looming in front of him, an open sky and a sea of grass as far as the eye could see. He made mention of the front line soldiers sent out by the savanna or timber which allowed the advancement of the savanna and timber upon the prairie. Wild plumb trees were sent out as a front line defense or offense depending upon which the environment favored. Sometimes the battle would be won by the prairie and other times by the savanna and eventually a total overthrow of one over the other but the soldiers of the front line are always forgotten for they are in this “la la land of transition”. I was reminded of them that day in Cedar County, Iowa as I observed the grainy grey coats of the now vanished front line soldiers of the savanna who left their mark upon the prairie soil profile. Were they lost in battle as they succumbed to the forces of the prairie or were they stopped dead in their tracks by the ever- advancing moldboard plow? I am reminded of my life and how it is much like this ever- changing world that we know as Prairie and Savanna but not a struggle or battle but the ebb and flow with the tides of life. Just as every component of the prairie and savanna are a part of the total wonderment of creation so are we. Are we on the frontline of change? Do we have the courage to move forward regardless of the elements that we face? The lessons of the land are there for all of us if we just open our eyes and hearts and breathe in the intuitive powers of this great planet. Iowan’s are planting native wildflowers and grasses at one half the cost of the seed. Through a special program and a cooperative effort amongst private growers, Iowa DNR and Pheasants Forever, it is possible to get a voucher to add much diversity to your landscape using species that are native to Iowa. This is a one of a kind program that benefits everyone involved. It provides wildlife cover for pheasants, deer, rabbits and a host of beneficial insects including butterflies, moths and many other pollinators. The natives include such species as Indian Grass and Big Bluestem which root down to enormous depths into the soil which control erosion much better than European imports such as Broom Grass. Iowa witnessed one of the largest and fastest ecosystem loss in the world as the Tallgrass Prairie was very quickly turned into corn production. Millions of acres of black rich soil that had been created by the deep-rooted prairie has now vanished. Thanks to this special Habitat Program created by the cooperation of Iowa Landowners, Iowa Native Seed Growers, The Iowa DNR and Pheasants Forever, the once lost Tallgrass Prairie is returning to once again replenish precious topsoil and control erosion. Pollinator Week is June 18th to 24th! Plant a garden that butterflies, hummingbirds, and bees will love as much as you! According to the Xerces Society for Invertebrate Conservation, there are over 4000 species of native bees in the U.S. alone. Bees are the most predominant pollinators of flowering plants in nature, thus contributing a vital service to the ecosystem. Bees are referred to as “keystone organisms” because of this important role. Some native bees have names that reflect how they build nests—leafcutter bees, mason bees, miner bees, carpenter bees, digger bees, etc. Others are named for their behavior, which include bumble bees, sweat bees, and cuckoo bees. In addition, some bees are named for the types of plants they pollinate such as squash, sunflower and blueberry bees. When honey bees are in short supply, the pollination needs of many crops can be filled by native bees. Research reflects that native bees can be major pollinators of agricultural crops and sometimes do the job more efficiently. For instance, the blue orchard bee is a primary pollinator of cultivated apples. Another important crop pollinator is the western bumble bee, which has been used to pollinate cranberries, avocadoes, and blueberries. Native squash bees are major pollinators of cultivated squashes. Some native bees are even commercially managed like honey bees to provide pollination services. Great news for Iowa native plants and pollinators! 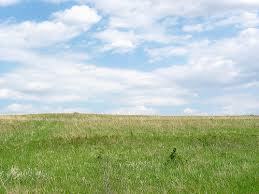 Tallgrass prairies once covered over 170 million acres (69 million hectares) of North America. They were a sea of waving grasses that stretched from the western edge of Indiana into eastern Kansas and from Saskatchewan, Canada, into the northern regions of Texas. Picture the corn and soybean fields stretching for miles across the horizon. Now replace this scene with a sea of wildflowers and grasses. As the wind blows and you look straight out onto the edge of the horizon , witness an ocean of undulating textures and colors making huge waves blowing across the vast landscape. Goose bumps form on my arms as I am once again with the great spirit that made this land and I am witness to a virtual native landscape vision. Perhaps my Native American blood can sense this feeling as maybe I used to roam these lands hunting buffalo and using many of the plants for food and medicine.